Last night I had pork tenderloin in mind and wanted to try to try something different. As I was perusing my cookbooks, a lot of wonderful ideas were presented to me, but either the recipes were too long to prepare, not enough ingredients on hand and going to the store was not an option. After, what felt like hours of reading, I closed all my books and walked into my kitchen. I started gathering ingredients. One recipe sauce stuck with me using Marsala. Not having enough to make a sauce, it is must to at least have 1 cup of liquid to make a nice thick sauce, I reached over and grabbed the Port wine. Mixing the two was something I never did. 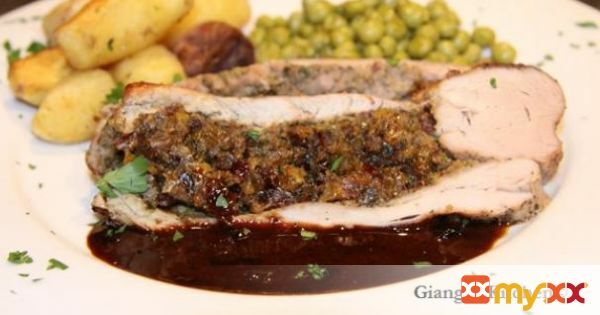 The result was a great thick sauce, rich in texture, perfectly balanced with the pork tenderloin and stuffing. 1. Preheat the oven to 450 º. 2. In large skillet, over medium heat warm the olive oil. Add the onions, shallots and mushrooms. Cook until the onions are translucent. Remove from the heat. 3. In a small food processor add the dried apricots, raisins, dried cranberries, parsley and the onion mushrooms mixture. Pulse for a few times until everything is minced and well combined. 4. Cut the tenderloin in half crosswise. Butterfly each sections making sure not to go completely thru the meat. 5. Salt and pepper generously each section. Spread the onion mushroom mixture over on side. Place the other half of the meat over the mixture and seal the sides with toothpicks. Season generously with salt and pepper on each side. 6. In the same pan that the onions were cooked, heat ½ teaspoon of olive oil and add the pork tenderloin. Sear each side for about 3-5 minutes. 7. Place in the hot over and cook for another 20 to 30 minutes, or until no juices are running off the pork tenderloin. 8. Remove from the oven, transfer the meat on a dish and cover with aluminum foil. 9. Pour off any fat from the pan, or bits of meat that may have fallen from the pork. Add the marsala and port wine. Bring to a boil and with a spatula scrape up any browned bits on the bottom of the pan. Add any pan juices from the tenderloin and continue cooking until the sauce is reduced to ¼ cup. Remove from the heat and add the butter and cream. Swirl around to ensure butter is melted. 10. Remove the toothpicks and cut the pork tenderloin crosswise. Arrange on a plate and pour the sauce over it, or alongside.